Ford: Do you know where you are? Ford: Yes, Dolores you are in my dream. Tell me, do you know what this dream means? Ford: No,…dreams mean everything! They are the stories we tell ourselves of what would be, who we could become… Have you been dreaming again, Dolores? –…imagining yourself breaking out of your modest little loop,…taking on a bigger role? Lets dream. What about a world 10–15 years into the future in which larp methods have become mainstream and blockbuster larps have evolved from being the entertainment for a few to representing a distinguished part of adult education, introspection and self-improvement? Let´s speculate about a future which already got envisioned in Larry Niven & Steven Barnes` novel Dream Park (1981) rendering a science fiction scenario which seems to become reality nowadays — or at least a likely reality. Disney is adopting larp ideas, the first larp park in China (Macau) aiming on teenagers just opened in 2016 and a prototype of interactive role-play is getting tested in a theme park in the Emirates: is this the start of larp as an entertainment for the masses? Will it become a “drug” — an escape hatch for quick fun and distraction — or a method for teaching meaning, history or even science? Which stories or game mechanics will prevail, get changed or adopted if larps are catering for more and more people in re-runs? Which kind of larps will get offered and get critical acclaim or develop to become commercial success? Which kind of game designs are or will be fit for the masses? Many questions I may not be able to tackle in this article, as the answers will be found in experiments to come, but I may speculate or extrapolate. What may happen if our dreams get industry-made with a high production value and we are getting invited to step into our most cherished themes and becoming the hero ourselves: a pirate, a princess, a servant, a tribe leader or the captain of a spaceship…? What I can do right now is making an account for some of the history of larp parks and the vision where those are deriving from. From the phenomenon of blockbuster larps in Nordic larp which grow on strong storytelling based in recent media history (series, films, books) up to theme parks hosting larps, the Star Trek project in Murcia and Jordan and experiments of Disney — such attempts exist but how do we extrapolate their potential and development into the future? Is the potential for interactivity exploited well in studio theme parks run by Universal or Warner Bros. or film parks dealing with history like e.g. Filmpark Babelsberg, close to Berlin? Why is the benchmark of passive “rides” and exhibitions only slowly evolving, incorporating more and more effects, but not more of well-written role-play? How close does sci-fi blueprints from the past come to describe the given options and possibilities of the present? What blueprints of today might prevail the test of time in 10 years? Where does “immersive exhibition” or “immersive theatre” end and where does start “larp”? Are costumes, pre-written characters, safety-rules or workshops already part of the package deal? Does extensive briefing, debriefing or professional media coverage accompany such a game in its course? May games in the future be mediated by technology or more by story — or are firmly based in both? Preparation and in-depth debriefing may not be only valuable to get feedback from players or a possible audience, but to help reflection about the personal experience. In larps you embody a story, as if you have lived it for a while, not just understand it as a possibility for the future. As a consequence it may help raising awareness that stories like “Running Man” or “Hunger Games” might become very real, if we do not pay enough attention to how our environment gets gamified and our roles pre-written. Our brain is primed to perceive and remember bodily experience as “real” and to react accordingly but it also does this with incomplete stimuli — in the absence of adequate stimuli meaning gets constructed anyways and patterns recognized,…or imagined. If the passive mode of being a mere spectator gets left behind and a visitor becomes a player who might interfere with a plot or a world, this “agency” can create tension, entertainment, good conflict or maybe just headless hyperactivity. Larp as a method of play between adults who trust each other to perform a story together could be a powerful form of social play, rehearsal and transformation — used for experiencing a theme, a point in history, a moral dilemma, a family tragedy, a battle, a romance, a murder — without hurting anyone. Amusement parks could embrace crossing borders with responsibility to enrich their experiences and offer unique settings for visitors loving a particular backstory or theme. But, if parks will develop that way and expand into more interactivity than offering “rides” in the future will depend on their vision, courage and also the evolution of larp. It also may show if the providers of modern entertainment accept the challenges to test highly participative formats to make them safe and attractive for a wider audience. Nordic larp is sometimes described as “social extreme-sport” which is not for everyone. I do agree concerning extreme formats, but not for a low-threshold of role-play which has proven to be attractive, functional and fun for a cross-cultural international audience in recent experiments like e.g. the “Legends of Arabia”. Lets dream about a niche market of millions who would like to try out this “sport” becoming someone else, immersed in a believable scenario. They might learn and get trained to become better players, demanding eventually more complex set-ups, similar to the development in some of the larp scenes, like in the Scandinavian countries. The TV series “Westworld” is showing us the development of demand in an evolution of a larp park over 30 years — its achievements and pitfalls. A comparative approach of mediatheoretcial thoughts mingled with analysis stemming from cognitive science, psychology and transmedia examples may point into the science fiction of real theme parks in the future who would cater safely to our dreams and still being a thrilling experience dealing well with immersion and effects like “Bleed”. The concept of “Bleed” got developed in the discourse in Nordic larp describing that emotions get transferred between player and character (and vice versa) maybe similar to the emotions in a dream. This effect of emotionally strong experiences being in character is what players have to deal with, and may open a path of self-reflection and transformation. 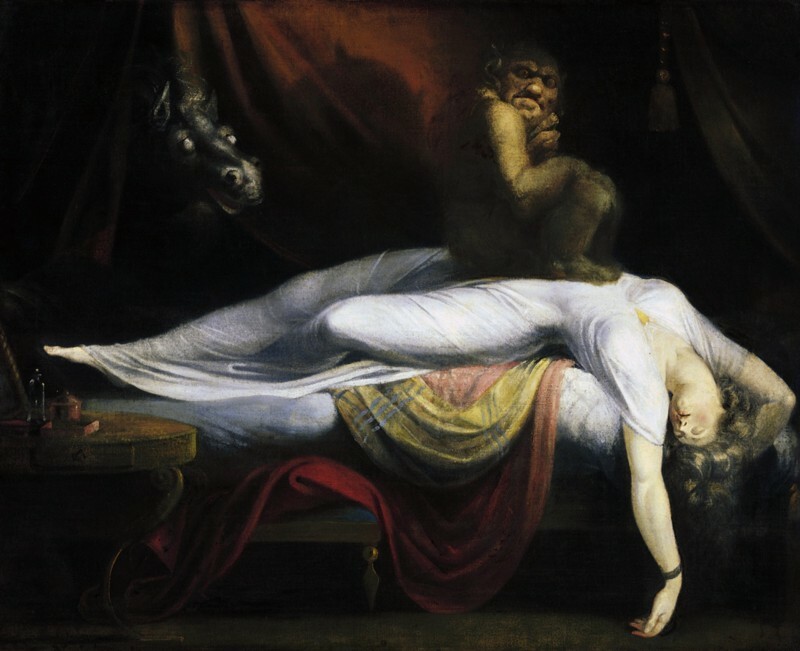 It may become more evident how close dream and nightmare might lie if you start to muse about the possible abusive application of those methods: What would happen, if your beloved fiction manifests in reality? Would you run there to become part of it with joy or would you run from it screaming with fear? And where to draw the border between the game master`s ethics, the boundaries of NPCs, players and the courageous willingness to take characters further and explore their story and potential? If you cater to a spectrum of storytelling, thrill seeking in high- and low-threshold immersion, do we need to find normative limits to what we let characters or visitors endure — at their own risk? Shall we save them from their dreams or unleash their transformational power, hoping for the best that they are able to cope with it? The transformation of a player into a fictitious character in a Larp could be described in a similar way. The border between one-self and the developing character in a story gets blurred, as one may not think anymore about who he is, what one would do outside of the game or “normally would do”. A larp may sometimes feel like a dream in which you dive and become somebody else, where you forget yourself. Waking up you find out that all was an illusion, obviously disconnected from your everyday life. I propose to think Larps being closer to dreams — on the one hand because of phenomenons like “Bleed” (Montola, 2010), on the other hand because strong immersion in a detailed scenography makes it difficult to distinguish between game and reality temporally, like in Zhuangzi`s dream of a butterfly. The particularities of a dream in comparison to the state of wakefulness can be summed up as follows: dominance of emotions, lack of distinction between environment and the self, unclear concepts of time and location, associative thinking and unreal and ambiguous pictures as the content of a dream. In a dream the experience equals reality, no matter how fantastic a dream may become. The total immersion in the world of imagination of a dream is perceived as real and effective — so much, that a mix of dream-reality and everyday-reality may lead to difficulties in orientation, if one wakes up abruptly. As players in a larp we are always also ourselves, so maybe a comparison of larp with “lucid dreaming” may prove to be more fruitful and “precise”. A “lucid dream” concerns a dream in which one is conscious that one is dreaming (Holzinger, 2009), often with a feeling of omnipotence, e.g. to escape consciously form a danger in a dream through “flying”. But it may be of consideration here, that a “voluntary suspension of belief“ could become as toxic for the drama in the fiction of a dream as inside of a game and may subvert the atmosphere — for yourself (raising the likelihood of waking up) and for others (e.g. you getting too conscious playing a role, so therefore behaving less naturally). Still, creating a story, re-writing fate or actively influencing the course of action are distinct features of a role-play experience, underlining this attempt to make a comparison. What do dreams show, other than wishes and fears as Freud presumed? (Freud, 1900) What do larps show in which we interpret, fill, create a character — in actions, that show something meaningful for other characters? In a larp the “diegesis “ — the external surroundings, the chosen space, the scenography, costumes, the answers of the co-players, all which is believed as a character, part of the fictional world and deemed true — determines the degree of immersion. Co-players are part of forming and maintaining this, thus influencing diegesis and immersion in a crucial way (Montola, 2003). In dreams all is fiction, all believable and true — therefore all what we believe as a dreamer (all imagined) can be called “diegesis” and all we assume to be true in a dream, derives from us. Orbrains are built to process bodily experiences as “real” and to react accordingly — but that includes also to actively complete and reconstruct stimuli which are incomplete. If you see half a chair, a quarter of a cow, you still recognize them. In fact, we are creating meaning through complementing patterns, all the time. This mechanism makes larps so strong and convincing, where one can personally experience reality as diegesis through a detailed immersion in a world of imagination. Immersion can have an intense effect, so that we as players are convinced to make real experiences in this fiction. But where does the benchmark come from, with which we are measuring how convincing these situations and actions are? How can we evaluate immersion, estimate how “real”reality feels and decide, if something fits perfectly into the game, or not? On the one hand life-action role-playing games are geared to the consensus of our co-players and organizers alike, which expose a certain concept about how a world should look and feel like e.g. a pirate´s nest or a town in the Wild West. We keep concepts present in our brains, which are used as a baseline for comparisons, for judging the delivery of theme or story in which a larp is embedded. Often these are passively consumed narratives like Tolkien`s “Lord of the Rings”, George Lucas‘ “Star Wars”, TV series like “Battlestar Galactica” or “Downton Abbey” — or more general genres like “Crime Stories” or “Old West-style”. Those stories or their remembered pop-cultural references are becoming sensuously tangible in larps as dramatic interactions. On the other hand, you may have been involved in the “real deal”, being a war zone (Iraq, Korea, Yugoslavia, Vietnam, Palestine…) or in the Navy and know how that really feels, being shot at or within a command hierarchy on a warship (in “The Monitor Celestra” there were players with a background serving in the Navy, e.g.). Then you may play larp with a different benchmark and are less drawing from stories than from first-hand experience. Still, how you should behave and what is the diegesis of the situation is still being learned, just the edge of real danger and real consequences to your position, career and life are off. In a safe zone of a larp, you can downtune your expectations, like the expectations of inexperienced ones may be uptuned, both on the basis of fiction. It is important to emphasise, that the “truthful reality” of these worlds got learned through narrative fiction — that means that fiction comes before a certain implementation or realization. Fiction first…really? Even though this might be not be “the truth” in public understanding of the “truth” of “reality” and certainly not yet scientific consensus, the preeminent position of fiction does correspond with the physiological base of our experiences in everyday life: Our perception transforms the things we perceive through our senses into schemes or concepts. We are able to keep these abstract entities we create present, but not all the details of an actual experience of that “thing” (e.g. a cow, a chair, an alien artifact, a room with a library…). Humans (and animals) do turn their actual experiences into a narrowed down fiction of their central nervous system — a fiction we can work with and live by. It is still enough detail to let us compare features and tell apart one chair or alien artifact from the other, but without generalization and categorization, no common story might be told. “A prince left the castle riding on his horse into the woods…” can be imagined in numerous ways (Is the prince blond or dark haired, the horse a white stallion or a black mustang? etc. ), not impeding general understanding. It is this freedom of understanding that makes language work, even though people may have different experiences. Importantly, we can remember and compare concepts at any time even though this “thing” (e.g. the mother, a red cup, a sword, a character in a larp) is presently not in our vicinity. Our memory and our belief in the continuity of things — that they do not cease to exist, also when we are not directly observing them — helps us keeping up our world-view. The crucial point I want to make is, that it does not matter if this world-view is an explicitly social one like a state, or a narrative fictional construction like Mordor in “The Lord of the Rings” — both are concepts in our neural system and experience may change them. The only difference is that we cannot act and interact with this fictional world in a way which is truthful to the narration, as long as we are not simulating the world well. But the obvious difference may be a lot less evident if we would become a common citizen of these worlds and neither have to power or will to act against Sauron or a totalitarian leader of a contemporary state. Important is that feelings and options to act and to perceive might be interchangeable as concepts and meaningful for both world-views. Todeepen the point, one has to accentuate that we do interpret our surrounding with our senses, but do not fully perceive it. Our sensors only relay physiologically “so and so much at a certain location of our body” to the central nervous system, but not exactly “what”. That is the called the principle of “undifferentiated coding” in which the activations of our sensory cells do get translated into depolarizations of nerve cells (Segal 2001 & von Foerster, 1985). Their succession in time (sometimes called spike trains of “firing neurons”) is getting interpreted by our brain. These activities trigger and modulate the firing pattern of larger “cell assemblies” in the cortex and give rise to concepts and their weighed correlations with each other, ready for making comparisons. The exact mechanisms in time and location in the brain for the emergence of concepts and binding these to trains of thoughts as well as how memory gets triggered for comparison are still mysteries unsolved, even after 40 years of neuroscience and intense attempts to break the “code” of the brain. That we have and act upon these representations seems to be an obvious fact, but less so that we create the consistence and continuity of our environment ourselves through the complicated interplay of memory and emerging concepts. We are to a lot lesser degree rooted into a current observable reality than we might think. This might be a bridge to psychology teaching us that the stability of our world-view, thus our environment, relies on our expectations. Our fragile balance of representations might not be absolute and forever, but may change any time — trough learning or illness. Important is that we are aware of having these constructs, and that we are living rather in a world we constructed for our (mental) needs — flowing representations which form the improvisations in our life. One may call this dynamic performance of construction the “Transformation of Things” after Zhuangzi, because those representations we create through experience do not match reality a 100% — they are something else, a translation into a individual set of dynamic constructs, tainting and interfering with each other in a constant way. The butterfly is not found as a single “picture” or “3D model” in the nerve cells of a head — but more like a network of remembered features and references like joy, spring, a scientific name, a table tennis product, the butterfly effect of chaos theory, concepts deriving form our memory. How this is being achieved by a nervous system is not yet fully explored or understood. But this transformation also provides the freedom to categorize things that do not fit into an exact scheme as “the same”, despite all differences. This renders a character in a Larp believable, even though it might not be a 100% well played or boasting a perfect costume. The structural similarities to a protagonist in a book are enough, when we speak, fight, or negotiate, or flee together. On the other hand it also shows, that we deal much more generously with “reality” than we are aware of. OOur wishes may become true, and people work hard to make some wishes a playable reality. Actually it might be the game of all of us. A dream therefore can become reality to a certain extent, but also part of a fiction, which is actively open for interpretation, using fantastic elements, like dragons, Elves or an aunt from the Victorian epoch. 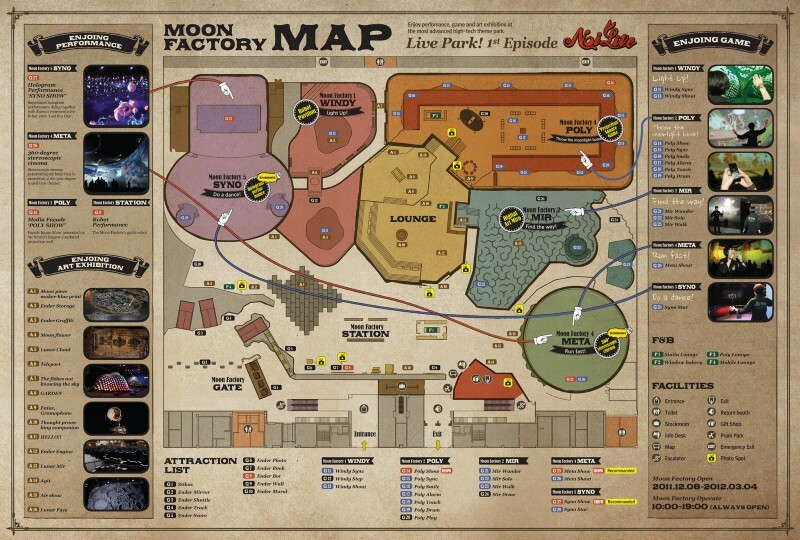 Larp parks could be theme parks which offer larps commercially or use methods of larp and participatory design. One may imagine worlds with designed dramatization, which represent a given narration in a believable way — and invite players to create meaningful interaction. If the passive moment for an audience just observing action in a normal park gets omitted and the visitor is invited to be a player who may interfere with the fictional world, two things might happen: freedom to act can be exciting and entertaining, or it can induce anxiety and may feel exhausting and overwhelming. It depends on the comparison concerning your own expectations regarding certain fiction as well as creativity and responsibility of the organizers, writers and scenographers who translate the canon of a story, which serve as the base of the game. Playing a character of a refugee or crew member in a well-done space simulation like in the Nordic larp “The Monitor Celestra” (inspired by the TV series “Battlestar Galactica”), the German re-design “Projekt Exodus”, or playing a servant in “Fairweather Manor” (inspired by “Downton Abbey”) does exactly that: fiction becomes successfully a playable reality. But these larps are limited events, no bookable offer for a bigger audience or countless repetitions. The responsible creation of a dramatic world, in which game masters and players are showing each others how close they are to the blueprint may lead to a new format in the entertainment business — or it may be too complicated and nerdy for a broader appeal. But “they” also said that in the 80ies with regard to video games. The role of a visitor in an amusement park is therefore a different one, and one cannot expect the same motivation, understanding and collaboration to occur or in the same intensity. To put it bluntly, you cannot count on the benevolence and cooperation of a client who just paid 150EUR to get entertained for a whole day. Sandberg underlines the fact, that Larps are usually highly cooperative endeavors in which reign a certain tacit agreement that everybody would do all they can to make it work. In commercial parks this would translate to the service you offer, a service you pay for — and this changes the attitude and expectation of visitors. DoChinese dream of dream parks? Well, yes, as there existed an “American Dream Park” in Shanghai from 1993 till 2001. The theme was strangely America, the US, with Disney-style attractions (without the branding, the characters or distinct storytelling) and it was popular with the young Shanghainese crowd of these days, immersing them into a world of Western aesthetics and the promises and achievements of the “American Dream”. For China of the late 90ies this sounds fascinating enough because the party leadership let this distorted, recreated mini-version of the Capitalist west tell it´s story as a narrative experience for about a decade. Do larpers dream of larp parks, one may ask — maybe, at least the fascination of amusement parks lead to using an abandoned one for larps in Vaasa, Finland. A Finnish and British team of organizers created a larp titled “Freakshow” for 2017 aiming to instigate the atmosphere of a former side show of a circus, a cast of “freaks” in a suitable “authentic” surrounding. The usual nature of singular or only a few runs concerning larps may prevent larp organizers to provide a repetitive, regular offer for a wide audience, as each run is special and often a development in story, techniques and scenography. To offer a permanent experience one also needs to own an attractive location or afford the rent for it — all things not easily found in a community used to a low-cost DIY approach. I would rather like to connect the history of theme parks offering role-playing elements with the novel “Dream Park” from 1981 (Niven & Barnes, 1981), which describes the vision to bring fiction to life with larps — a vision which now seems to be technically within grasp. It´s story in which dreams get marketed as experiences supported by technology and competitive games. We could compare this fiction from 35 years ago with the current reality of development in technology and methods in live action role-playing games: is a professional vision suitable for a mass audience comparable with larp tourism and blockbuster larps nowadays? A quick answer would be: no — we are far from parks envisioned in the novel, but the ideas expressed in the story are prevalent and inspirational. Dream Park was the first collaboration of Larry Niven and Steven Barnes for a novel and they not only combined ideas from fantasy-role-playing games like Dungeon & Dragons (which were very popular at that time), board games, crime-plots, paintball (which just got introduced) but also war simulations from the military sector. The book and its scope was a huge success not only with sci-fi readers and critics, but also with gamers and could have influenced the formation of Larp culture in a decisive way — if only through sparking a certain expectation and attitude. In the USA e.g. the fictional IFGS — International Fantasy Gaming Society took shape in reference to the book (a successor is still operational, see IFGS, 2016) and they started to prepare Dungeon&Dragons for a live setting (Lancaster, 1999). For judging how close we get with international efforts to offer more professional solutions in larp design, we need to look deeper into the story framework of the novel. Although the characters depicted are not very deep or complex and the mystery rather mediocre, the description of the game keeps on capturing the minds of readers. The park in the book is rendered as a kind of “Super-Disneyland” full of holographic projections and short show-events next to bigger computer-aided games in specific enclosed sectors over several days. A game master supervises and directs this physical area of play from a game center, as he prepared and programmed a full world for it, including quests, traps and dangers. The world is enhanced by actors and virtual monsters against which a master of myths and his Team are competing — to solve the riddles, returning “alive” out of the story and to master the given main task in a pre-defined time span. In between they are allowed to have pauses for rest and food — out of the game, but still in the world set-up for them. The story is set in the near future and the games are envisioned as competitive, including popular player personalities like in sports with a certain star status. A public hall of fame with experience points and rankings is getting updated through individual bravery, applied skills and successful fights individually and in a group. The game master is part of the international ranking, because players who do not solve the riddle or do not survive, he will loose their points to him. Also in 2017 this obviously is not matching the perception of larps in public opinion or the reality in the media landscape, even if you add odd Reality TV formats and survival-in-the-jungle games for B- and C-prominent stars and starlets. Only books and movies like the “Hunger Games” series come close, and get expanded to a socio-political conspiracy, where such games are the tool for suppression. To aim on transformation and entertainment seems to be a high goal, but exactly that may be a strength of larping, also in a more for suitable for the masses. The emotional depth and intensity experiencing a certain world as somebody else, to invest in that character and then to be able to reflect about your own expectations and decisions is something totally new in the sector of entertainment. What you do invest in your role may show something about yourself. This kind of “depth and sense” can become popular, as the Human Potential Movement and seminars for self-awareness in the 70s tantalized hundreds of thousands of followers. But the sheer option might still not be enough to automatically make every role-playing activity into revelation of self-awareness — on the contrary, a dull written game might not spark much of self-reflection and increase the numbness and even grow passive consumerism again, this time for participatory games. After the publication of the first volume of the Dream Park Trilogy the authors got contacted by Mark Matthew-Simmons and he secured the permission to name his organization “International Fantasy Gaming Society” like in the book and to provide Dream Park-inspired adventurous experiences. One of the novelists, Steven Barnes, took part in an early LARP called “Ancient Enemy” based upon Australian mythology, with human players, actors against the local backdrop. The adventure took place in nature and in prepared locations indoors, including white water rafting, mountain climbing, sword fights and magic, according to the Barnes “…the best time I ever had” (Barnes & Niven, 2010). Even though a successor of the IFGS does exist till today, their approach in game design did not seem to have to developed in the last 30 years — on the contrary, the account of Barnes still sounds fresh and distinctively different from a “normal” Larp campaign. Also a board game got produced under the brand “Dream Park”, a remarkable incident in which a role-play is based on a book about role-plays. Also a role-playing book for this board game got published by R. Talsorian Games and written by Mike Pondesmith. But despite the vision and early hope, the history of larp parks which saw the light of the day do not seem to be blessed with luck or tremendous success. There are only a few playable projects survived for more than a few years. The attraction “MagiQuest” designed for children in Myrtle Beach, South Carolina, and its branches follows a distinctively more humble strategy without sword fights since 2005. What you get there to start your adventure is an electronically enhanced magic wand or compass which enable the player to interact with objects in the park. The wands work with infra-red, have an LED on their tip and are equipped with motion sensors. In a diameter of several meters one may activate game objects like pictures at the wall, statues, tiles, animatronic treasure chests, video kiosks or projections in rooms through swinging or pointing the wand like “casting” a spell. The customized compass in the Compass Quest has a built-in RFID chip and interacts with a detector if they are close enough. The players called “Magi” have to find different objects in the play area and complete quests to gain gold and experience points. The individual status of the game gets saved centrally and is available in the different locations of the franchise. The target group seems to be children from 6 to 14, only 2013 the simplicity of the game design got expanded with a slightly more challenging “ShadowQuest”. Technology and interaction may not be state-of-the-art anymore after the smartphone and tablets brought more “magic” into the hands of children. After the closure of the original site in Myrtle Beach in 2015, MagiQuest Fun City in West Nyack (New York) and MagiQuest East Hanover (New Jersey) followed. End of 2016 only the location in Tennessee Ende 2016 will be open, together with facilities in the Great Wolf Lodge chain who bought the production company of MagiQuest and a location in Japan in the vicinity of the Tokyo Dome. Progress in technological developments seem to be both a blessing and a curse. The biggest hurdle seems to be keeping a physical park up to date — but it may also be the biggest opportunity to incorporate and test the latest gadgets and attract visitors through staying at the leading edge of innovation. The concept seems not to fit the target group, but rather families from mainland China or Hong Kong. Teenager and young adults or international tourists may be quickly bored by something appealing only for children. It is obvious that to miss the mark with promoting an experience with a certain atmosphere and then offering something else may turn out to be a grave errorwhile trying to attract a wider audience and building up a fanbase. The players get handed out a book with a touchscreen (approx. the size of a bigger smartphone) inside a customized nice frame which triggers certain games and collects the points won in these games. You can choose the language but the exchange of information only works one-directional as the games send the status of the game to the devices. The visitors do not get a character or class assigned, let alone they are allowed to choose or customize one. They do not have to make any meaningful decisions which may render their experience unique and do not support re-playability or capture you with a strong backstory. Enabling the option to make meaningful decisions can be called the quality of well-designed role-playing elements. The games provided in PlanetJ seem to be repetitive and not very immersive. During your stay no story gets built up and it seems to be more about the numbers of games you may be able to play within a certain time-span and the collection of points rather than about the quality of storytelling. Planet J`s concept is based on a new world they created, with magical creatures and stories, but the characters of these stories are so far unknown to the audience, they only get exposed to them inside the park. Empathy and immersion depends strongly on diegesis, so what you know is being true in this world, is the fiction you can compare it to. Of course you can build up new story lines and myths within a park, but it will take more time and effort or would need to be very vague to fulfil at least an overall reference system. To surprise well and make people care in a short time is already a hard task in making movies and writing scripts. Still, an either well designed or well known IP would maybe have been advisable to attract the masses and get back the investment for development in a reasonable time. Interactive exhibitions themed with Star Trek have a turbulent history. For ten years (1998–2008) an immersive exhibitions of rather medium size called Star Trek: The Experience was the attraction in Las Vegas Hilton in Paradise, Nevada. A Deep Space Nine promenade deck as well as Quark`s Bar with characters from the Voyager series have been part of the set-up, well-scripted interactive shows like “Klingon Encounter” or “The Borg Invasion 4D” have been praised by fans and set benchmarks to at least satisfy the expectations of adults. The storytelling, some effects, the scenography and involvement prominent Star Trek cast members addressing the audience in a unique way made these experiences and memorable. Still, it got discontinued, and up today despite of rumors, there seem to be no serious efforts to create a new edition. Maybe one reason is that the whole exhibition got sold off in auctions in 2010 and what was not being bought got destroyed — so building up a new environment would mean to start from scratch. Two projects of theme parks based on the Star Trek universe had gotten prominent support in the last years — in Murcia, Spain, and in Jordan. The project in Spain got announced in 2014 as part of the upcoming Paramount Park in Alhama de Murcia and developed till 2015, but the start date of construction shifted again and again. As the president and owner Jesús Samper died in December 2015 and investors turned down the option to save it, the project was being set on ice indefinitely. The mayor of Murcia offered to repurpose the area for “agricultural usage” in May 2016 after the failure of the new management company Premursa to raise new venture capital. Jordan`s Kìng Abdullah II had expressed personal interest to support Star Trek to become part of the biggest development project of the Rubicon Group Holding in the coastal town Aqaba — not as an investor, but as a patron. It happens that the king is a dedicated Star Trek fan and had already small guest roles in Star Trek: Voyager, what probably motivated him to boost the $1 billion development of the theme park “Red Sea Astrarium” for the region. But due to the events in the Middle East — the uprisings in the Arabic spring, the civil war in the neighboring Syria and the expansion of the fundamentalistic group DAESH — the numbers of tourists plummeted and the plans to create a family-friendly theme park got postponed. RHG, the figurehead of the sprouting Jordan entertainment industry had problems with payroll-liquidity was forced to lay off staff in 2015, which hinted to further delays and a possible end of the ambitious project. But still — Larp as entertainment for the masses does indeed inspire the R&D departments of big entertainment multinationals. Disney after all researches these methods for years for their successful theme park ventures in a special unit called “Walt Disney Imagineering“, which also collects input from the European Larp scene. Disney`s Imagineers visited “The Monitor Celestra” and “College of Wizardry” to get a fuller picture of the current methods and Larp designs, which is a sign that fan culture and visionary craftsmanship very well deserves the attention of professionals. Investment company Miral developing Abu Dhabi`s artificial island “Yas Island” (appox. 30min outside the center of town) got convinced to support a prototype of a larp in one of their attractions in December 2016. The family-friendly Aqua park “Yas Waterworld” is one of the main attractions in the capital of the UAE, next to the Ferrari World (also developed by Miral), the famous Yas Marina Formula 1 Circuit and an upcoming Warner Brothers theme park. A team of 40 people were gathered by Nordic larp organiser Claus Rasteed (Dziobak Larp Studio, Rollespilsfabrikken) and Paul Bulencea, an expert for innovation in tourism, who had pitched the idea to Miral in a competition to sketch the future of the island — in this case through the idea of creating a larp park. “Legends of Arabia: Quest of the Pearl Tribes” was set out to be a one month project conducting 3h Larps in the evenings when the Aqua park is normally closed, using the scenery, sound system and its theme as a backdrop. The larp designed to work with “1–500 people” pays tribute to the Emirati heritage of pearl diving and unifying tribes like through the theme of ‘The Legend of the Lost Pearl’, which is reflected in the waterpark’s design and each of the waterpark’s rides and attractions. The team — which I was part of — was coming from 16 countries (but mostly European) and had the task to translate and embody the story for visitors of diverse backgrounds, age and level of English, so that meaningful action and play may unfold. Vested in Arabic costumes and equipped with latex swords the story of the Mother Pearl cursed by an evil Water Spirit and the tribes fighting each other until their differences get resolved was replayed many times — and every time the curse got neutralized through a special ritual performed by all of the players. This kind of permission for interaction “get a costume — get a sword — be a hero” was so far unknown in the UAE but those who found their way to the waterpark at night seem to have given themselves the permission to play and dived zealously into sword fights, riddles, treasure hunts and chasing bandits. The key tool for facilitating interaction and lowering the threshold was not so much the story, but an old tool in larp history: the latex sword. This key factor sparked understanding and playful interaction almost immediately, no matter what cultural background, gender or language was showed up. The spectrum of age (4–80) and the low threshold for understanding also posed a downside, as children had clearly the best time and adults or parents coming along were reflecting this happiness, but were given less challenge through the overall design. The game solution proved to be a good design for the waterpark to extend their audience and give them a different approach to the park´s theme — but the depths of what larp can be and convey to people might not have been fully disclosed. It certainly opened the doors for raising interest in larps and instigating understanding in the generous and very welcoming multi-cultural society of the Muslim UAE, consisting only of 15% Emiratis but 85% foreigners. But whether this experiment may lead to the creation of a larp park in the end remains an open question. But at least the seed is planted for shifting the focus of the local entertainment industry who are juggling billion dollar projects to more interactive forms of play and narration, moving away from the passive rides which are competing against each other on every corner there. 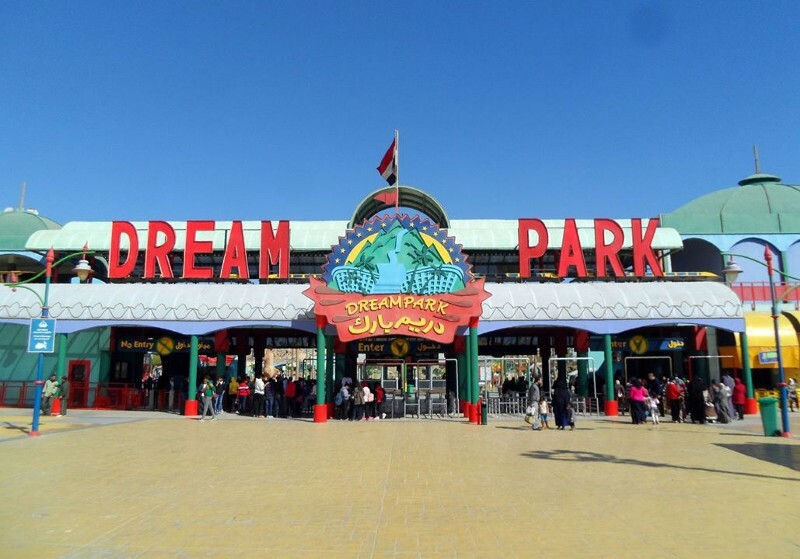 Talking about passive rides, this theme park in Cairo, Egypt has the dream in his title, but is it also about dreams or offering role-playing by any means? Simply, no — as titles might be deceiving, some dreams of children may be fulfilled here, but this dreamy promise of the dream park novel is based in another dimension — they do barely overlap in concept. Still, it might be fun “vintage” park and families might be happy to visit a concept proven to be bodily fun. On the other hand, security might not be the biggest strength of the biggest amusement park in Egypt, as visitors tell of staff looking away when people stand up in flume rides while plunging down and chain carousels not making the appearance of being entirely safe or well maintained, but maybe that changed in the meantime. Funnily some of the staff did wear branded t-shirts misspelling the logo reading “Drempark”, at least in 2010. Egyptian visitors seem to be very joyful and happy customers, having a good time with the rides and even spontaneous dancing is not uncommon. That attitude in dream parks I would wish to become true in future version filled with more story-driven interaction. This rather special attraction did try to blend a strong, epic story with a personal experience and at least some level of role-play from 1993–1996 in the UK. A brainchild of John Gorman and Gary Gillies it was officially based on the “Alien” movies and envisioned to expose visitors to an Alien infested environment — for “real”. It opened an permanent location in a basement in Trocadero, Picadilly Circus, London after starting off as a mobile event at various exhibition centres in the UK (including the Bournemouth International Centre and the Aberdeen Exhibition and Conference Centre). Sigourney Weaver, star of the Alien series was supposedly present at the opening event. I was experiencing “Alien War” myself after some hefty rounds of laser tag nearby with some friends in 1994 — and I liked the brief dip into a scripted experience very much. It was not giving as much agency as laser tag, but it was a lot more cinematic recreating the thrilling atmosphere of the movies. The permanent attraction in London closed after a flood in August 1996 and was never reopened. Altogether an honorable attempt to give fans something else to do than to wait for the next movie to come, even though this was a private initiative and not one coming from the production company or the authors. It made a short return between December 1999 and January 2000 in the Scottish Exhibition and Conference Centre in Glasgow in a modified form. It seems that a number of exhibits from Alien War and the associated Movie Magic Exhibition (Glasgow) were acquired by IDEAS, an Edinburgh-based design consultancy, intended for inclusion within the UFO Land, a Sc-Fi Museum, part of the Zenith Project and Scarborough Council. College of Wizardry (CoW) is a larp set in an world inspired by about Harry Potter by J.K. Rowling, taking place in the caste of Czocha in Poland in several re-runs starting in November 2014. The larp centers around the College of Witchcraft and Wizardry a school for wizards and witches alike, taking classes as well as fighting evil and engaging in teen-drama. The first three runs conceived and set up by Liveform (Poland) und Rollespilsfabrikken (Denmark), two collaborating larp associations, were unauthorised but tolerated by Warner Bros. who hold the rights about the Harry Potter universe. But from then on the College had to become untied completely from the well known storylines and become a “normal” place of education in the magic arts — so no Muggels, no Quidditch and no Hogwarts references. In March 2017 there will be the 11th and 12th run of the larp and recently a German spin-off called “College of Wizardry: Nibelungen” took place, as well as a US version all supported by the original Larp creators. The “New World Magischola” ran a very successful kickstarter campaign in 2015 where they raised USD 300.000 within 42 days, exceeding the initial goal of USD 35.000 about 10fold. In 2017 the initiative of the producer “Learn Larp” will get into their 8th re-run and is even setting up events where students from the Polish, German and US schools can meet and compete. The CoW Larps are not theme parks or attempts to create one in itself, even though the initial ideal of CoW was to raise enough money through crowdfunding to buy a Polish castle and use it as a permanent Larp location. The “Potterverse” instead has new destinations to visit for “real”, as the trademarked Hogwarts School of Witchcraft and Wizardry or Harry Potter™ castle opened as an attraction in three Universal Studios theme parks. A replica of the castle from the movie is located on the “Islands of Adventure” next to the Orlando resort, since 2014 in Universal Studios Japan, and in Universal Studios Hollywood, where it opened enhanced with 3D HD technology in April 2016. The castle is built to exhibit Hogwarts to an audience and housing a motion-based dark ride called “Harry Potter and the Forbidden Journey™”, first made available in the “The Wizarding World of Harry Potter” in Orlando in 2010, now available in all these parks. These attractions with their rides are of course built to accommodate thousands of visitors per day leaving only minimal interactivity or basically no meaningful role-play for individuals. That seems the biggest difference in between the two approaches: long individual storytelling and depth of immersion for ~150 players in a larp and a thousand passive short experiences, walking through technologically enhanced exhibitions for thousands of visitors, including queues, restaurants and shops, in a trademarked theme park. Is the quality the same, or just the expectation different? Would Universal Studio visitors want to wear costumes and battle with dark wizards and magical beasts themselves? Would larpers want to queue for 2h and then take a ride which is more cinematic and full of characters they know and love, but have no real way of interacting with them? It seems that an intelligent blend of both worlds is still to be created, satisfying a crowd within a reasonable time which has acquired a taste for both styles, mixing active and passive “entertainment”. For sure a physical realization of a strong fictional story with millions of fans is an economic factor — for larpers, copyright holders and local politicians. Boris Johnson, Mayor of London, e.g. criticized the fact that the park was chosen to be in Orlando, rather than in London, stating that it was “utterly mad” to leave it to the Americans “to make money from a great British invention.” The battle ground seems to shift to the idea, to the story and theme itself, promising an audience which is willing to travel and to pay the admission, coming with their backpack of expectations, the learned diegesis of what is believable or closer to what is imagined. Satisfying this imagination and making it a temporal reality is a straightforward business, too. Parks which are not essentially stemming from a vision of role-playing, but based in the technology to display virtual space in addition to a designed physical environment shall be included, too, as they might point into the future of park design. With the renaissance of VR though projects like Oculus Rift, HTC Vive, Microsoft Hololens or Google Daydream options for applied usage in the entertainment sector, let alone the video games industry, resurfacing, like in the 90s there is a veritable hype around VR at the moment. Interest has been rekindled as affordable light-weight systems hit the consumer market. This gives also rise to high-end customized systems with higher resolution and better tracking, suitable to turn bigger spaces than one´s living room or a basement into a VR park. “Live Park” the world´s first 4D theme park is located in Korea´s capital Seoul. As a hybrid between a VR park, a 4D art installation and pop concerts mixing the virtual and the real world it has one very interesting feature — some sort of role-play. You get a virtual character which is assigned to you during your stay and which appears for you in many of the attractions and interactive games. Produced by d´strict the park´s 4D performance halls, 360 degree 3D projections, multi-touch tables, robotic performances and augmented reality artifacts offer a mix with a more developed artistic touch already since 2012. The offer comprises over 16 interactive art and music installations, five virtual reality games, four performance spaces, a lounge, and ten other attractions, all organized under seven ‘stages’ or themes. How far, in what way, and if the concept has evolved during the last 5 years is unclear. Projects like “Survivos” (former Project Holodeck of the University of Southern California), the Swiss based “Real Virtuality” or “VRcade” from Seattle all seem to follow their dream of creating a real-life holodeck like envisioned in fiction: Star Trek — Next Generation. “Zero Latency”, a Melbourne based Virtual-Reality-Arcade already opened in August 2015 and enjoys quite some popularity (10.000 visitors within less than a year). They installed their experience in a 350m2 hall where people see each other as avatars and play “Zombie Invasion”. Sega Live liked the experience so much that they decided to install it as a new VR-attraction in the Joypolis Amusement park in Tokyo already in 2016. Killing Zombies seem to be a first choice scenario (also VRcade specializes in this for the moment), but I suppose an infinite amount of space for different scenarios, more storytelling, and a well-balanced ratio of action and role-play remains untapped. “Starbreeze”, racking up support by Acer, Lionsgate and IMAX wants to open their own VR-Arcade calling it “Starcade” in Los Angeles soon, also counting on Zombies, this time with a strong narrative in the back, as they use Overkill´s “The Walking Dead” game based on the TV series — only immersing people in it with a 210° wide angle view, like in an IMAX cinema. They also produced a cinematic VR experience for their StarVR system called “Cockatoo Spritz” and presented it in Cannes last year. All these attempts are based on the dreams of people to actually do what they can´t achieve easily in everyday life safely: flying, fighting Zombies, steering a spaceship, becoming a gangster boss, solving a murder case, etc. Precursors of these dreams to become true in VR were simulators like the BattleTech Centers of “Virtual World Entertainment” in the 90ies, the “Vortex V3” Video Arcade Machine from 2001 which let you operate a gun turret or paragliding in the SMAASH Mumbai Arcade. Current flight simulators like “Birdly” from 2015 which, simulates flying like a bird in VR with a set of wings as controls and feedback enhancing the experience or “Icaros” which comes with a mechanical machine resembling a sophisticated fitness gear which is combined with Samsung´s GearVR may point into a new way of expanding the playground into virtual space. The strength of larp in comparison to Virtual Worlds or video games is not only the indefinitely higher resolution of real-world play or that every character is equipped with his own human-strength AI, but it lies in the improvisational skills of the players. The intricate scripted loops of machine-based NPCs who feel so far mostly a lot less fun than a real life counterpart and lack a kind of flexibility which we know from real-life interactions, including humor and irony as a response. You can script a lot of jokes, but creating jokes on the fly would be a sort of Turing test, exposing easily that machines are simply not capable of doing that. The real-world nevertheless is lacking “flexibility” in showing real-world effects of fiction: no dragons, no spaceships, no goblins, no magic, no aliens, no big explosions or “safe wars”. Only the latex sword can match the fun of fighting in virtual space, adding also the bodily sensation of getting hit hard with it — but of course, no blood. A plausible way of thinking could be to mix both worlds well, to establish as much of a live action role-play with costumes and a scenery matching the story and add effects like magic through technology, maybe projected onto the retina, as the fully enclosed Virtual Reality head-sets of today are still too bulky and “distracting” to offer flawless role-play incorporating detailed facial expressions and a meaningful real-word space. This strangely does remind of the setting of Dream Park, just that their technology of choice was a holographic projection system… — so technology brought us full circle back to the premise of fiction setting the benchmark for playgrounds developed and inspired by these stories. The movie “WestWorld” from the year 1973 in which holiday tourists pay for the time to play with humanoid android characters in different historical worlds of role-play seems still to be unattainable science fiction 40 years later. The film was directed by Michael Crichton who also wrote the best selling novel of the same title and the script. He put a high-profile actor (Yul Brynner) in the main role based on his performance in “The Magnificent Seven” from 1960 — this representing itself an Old West-style remake of Akira Kurosawa`s 1954 “The Seven Samurai” which shows that well performing fiction is inspiring fiction and setting a framework for new playgrounds. HBO reissues “Westworld” currently as a TV series with Anthony Hopkins as a star of the project and creator of the robots — the interest concerning such futuristic park scenarios in which humans, machines and stories collide and compete seems unbroken. But does it lead to a utopia for fantasy role-players or are we also facing our nightmares? In a study from 1986 Brenda Laurel describes the application of the concept of “Dream park” on a fantasy system which could be supported by contemporary computer technology (Laurel, 1986). But only in times of cheap, light-weight VR and AR solutions, smart phones, GPS and NFC (Near Field Communication) chips a park seems to come within reach, in which dreams could become true in a believable way. The quality of immersion can only augmented in an area, in which the “suspension of disbelief” is demanded by insufficient design. Diegesis not getting cared or designed for properly requires the player to actively and creatively overlook thinks and fill in the gaps, which may be straining — and less immersive. It is a hypothesis of this article that the more you provide and build to match or expand a certain fiction in detail, the more immersed the player will be. For some this may seem to be counterintuitive to the movement of Black Box Larps where players mostly perform without scenography and without costumes and very little props — only a black stage, sound, lights and human players. To experience that sort of Larp might be as strong and moving, but then the diegesis and backstory as well as the design are aiming on using exactly this minimal stage and trying to make the most of it, sometimes using only sound, body, simple props and no language at all (e.g. in “sensational larps”). Nevertheless could results from these laboratory tests out of the furnaces of rapid prototyping in larp culture, like workshops in advance and debriefings in the end add a lot of value to experiences designed for the masses. It might be like developing a kind of “oneirology“ (the scientific study of dreams) to assign meaning to the things you dreamed about and your role in it — and it might help one to digest an experience where you felt being really inside of one of your dreams. To let a dream become reality in a secure way can be a viable offer for humans spoiled or stressed by reality, but also a valuable asset for parks with a strong IP and the will to innovate and experiment, staying on the leading edge. It might also mean that the traditional passive entertainment industry may need and want to open its heart for the interactive art of live action role-playing to ensure that people enjoy participating in their “shows”. This also expresses the hope or utopia of a general change in how one “consumes” experiences — also in the sector of commercial entertainment. We get permission to show ourselves “who we could be” in permitting ourselves to play — inside of a world, rather than a “show” to only marvel at. Inside of such a well designed world, all what the character deems to be true becomes what the player feels, so temporarily this creates truth in effect and affect — reality, which might change you. Special thanks for editing Rafael Biena and Judy Nylon (English version).